One of the earliest science fiction television shows I fell in love with was Heroes. It’s not that I was temporarily addicted to Milo Ventimiglia’s rock-hard abs or to Hayden Panetierre’s “I’m invincible” powers. It’s the story itself that drew me to it. For a while, I could imagine that I was a superhero myself, with superpowers not yet known to mankind. I could then save the cheerleader and save the world. Of course once the 30 minutes or an hour was up, I would be back to my real world. I had to face the truth that I am just any other mortal being who’s gullible to any kind of pain and highly susceptible to death. There’s nothing much I can do for this world. Not when I started blogging. Blogging has become my outlet for pain, joy, anger, and frustration. It has been my own wailing wall. And though I have been doing this mainly for myself, I am glad to know that somehow I have inspired others not just to write but also to be honest to themselves; to be sincere in their thoughts; and to be more giving of their passion, knowledge, and ideas. Blogging has made me realize that I don’t need to breathe out fire, to regenerate, to fly, to blend in to my surroundings, or to travel in time and space just to make a difference. By merely expressing my thoughts and sharing a portion of myself, I am doing exactly the same thing to even just one person in the world. That for me already makes me a superhero. If you want to be a superhero or tap into your inner potential, I invite you to join the upcoming World Bloggers’ Day at 6th Floor of Ramon Aboitiz Foundation Inc.’s Plenary Hall on May 2, 2011. It will be from 1 to 6 p.m. Be there and meet the other existing and would-be heroes of these times. I cried today–no, I bawled. I was so frustrated at something. When I don’t get what I want, I immediately go into self-pity. This is what happened today–and perhaps in some other days. I’ve written quite a number of affirmation articles for my client, and I’ve always emphasized about counting one’s blessings. Sad to say, I sometimes fail to walk the talk. And I guess I am not an isolated case. Usually, even the smallest problems make us feel so bad about our own lives. We think we already belong to the worst lot. We become so closed up in our own little miserable world we forget our lives aren’t just all about us. Worse, our own troubles take our attention away from those that matter most–things, both big and small, that make life more meaningful and happier. Those blessings we often ignore or take for granted. I am blessed to have a good husband. He’s not perfect. He’s a person made up of a lot of flaws. But he’s the first one who gives me a hug when I’m down, who believes fully in what I can do and in what I am, who listens to my rants and pain, and who has been faithful to me for the past 10 years. I like the fact that he’s honest with me, even if the truth really hurts me to the core. Sometimes I deny them, but they do make me a better person. I am blessed to belong to a wonderful family. We’re not rich. We struggle a couple of times. Sometimes I find myself battling with them. But I could never discount the support and love they have for me, and now that I’m married, I learn to appreciate their presence more. I am blessed with friends who have been with me through thick and thin. I am blessed by a handful who, even if we’re miles apart, are only a phone call or e-mail away. I am blessed to have a good job. It’s a job that doesn’t only bring food to the table but also helps pay the bills, fund travel, support others, and secure our future. I am blessed that I’m generally happy. I may not have everything in the world, but I’m content. I am in the right place. And if I am blessed, I know you are too. So start counting them now. This might be the best summer getaway you can ever imagine! This coming April 20-24, 2011, we (that means YOU, your friends and US!) will be having a week-long adventure-filled activities in Bantayan Island! No more “UNHOLY” Bikini Opens or “Hot babe celebrities” that could ruin Bantayan Island’s reputation in the tourism industry. And that’s already including ALL the activities mentioned above! So what are you waiting for? 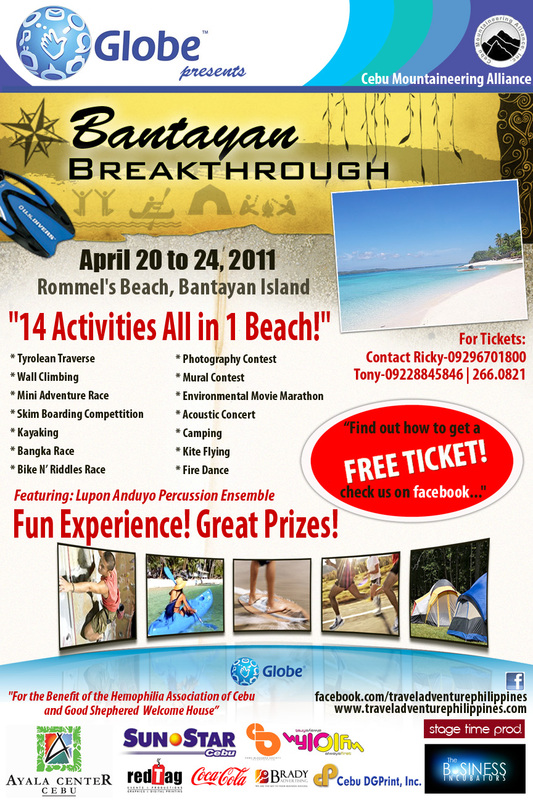 SEE YOU ON APRIL 20-24, 2011, at the Bantayan Summer Breakthrough! 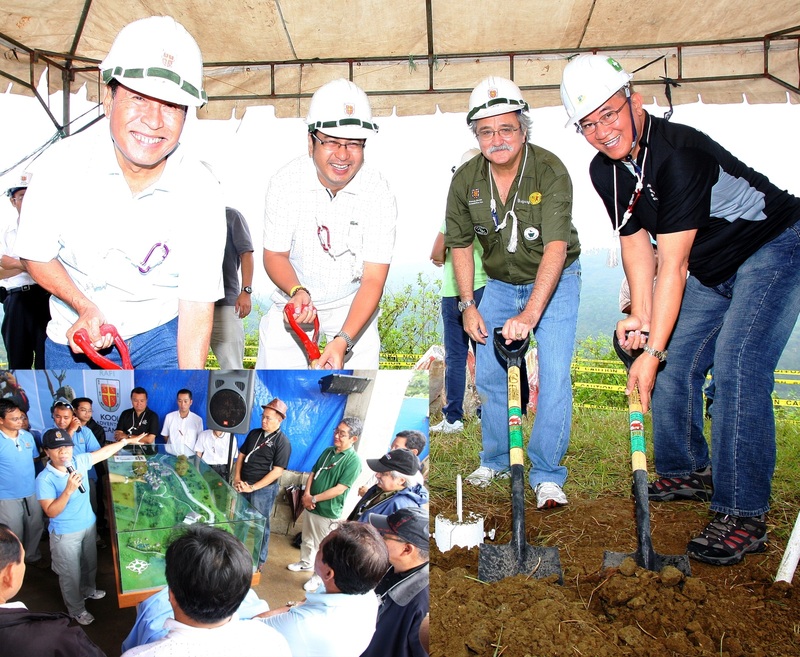 Ramon Aboitiz Foundation Inc. (RAFI) President Roberto Aboitiz (second from right) led the groundbreaking of the new Kool Adventure Camp of RAFI in Barangay Consumoroy, Balamban, Cebu. With him are (L-R) Cebu Provincial Board Member Alex Binghay, Balamban Mayor Ace Binghay, and Ben Azel Ponio, president of BSP & Company Inc., the main contractor for the construction of the KAC site. (Inset) RAFI Chief Operating Officer Dominica B. Chua (with microphone) explained to partners, campers, and RAFI employees the different features of the camp through its scaled model. After more than a decade of running camps with the youth and other sectors, the Ramon Aboitiz Foundation Inc. (RAFI) saw the importance of taking adventure to greater heights through the creation of the Philippines’ pioneer outdoor education center. RAFI officially broke ground on its Kool Adventure Camp (KAC) site at Barangay Cansumoroy, Balamban, Cebu last Mar. 26. The 10-hectare campsite is seen as the first outdoor experiential center in the Philippines. It will house outdoor high and low challenge courses, indoor challenge courses, corporate conference halls, training halls, trekking trails, dining & kitchen facilities, tent areas, youth bunks and corporate cabins. KAC will also feature the High Element Challenge Cluster, a challenge course that combines both low initiatives and high ropes courses in one. The campsite also includes an Iconic Structure, a multi-face, multi-element high challenge ropes course. “This is where we will grow and multiply the program,” RAFI President Roberto E. Aboitiz said during the groundbreaking ceremony, referring to the ongoing KAC program of RAFI. The construction of the campsite started on June 2010 under the supervision of the Aboitiz Construction Group Inc.-Metaphil Division. Construction is carried out by BSP Construction, Inc. The design of the entire camp site was completed through the collaborative ideas of architect Estela G.D. Lopez of EGD Lopez and Partners for the site development design, architect Socorro Atega for the landscape design, and architect Ed Gallego of Gallego Architects for the architectural design. KAC, launched in 1999, is an adventure-based education program that provides youth and adults with learning and development opportunities through experiential education. Its program offerings, which seek to build character, develop competence, and inspire active citizenship among its participants, include youth adventure camps, adventure training and consulting, corporate adventure workshops, land and sea leadership expeditions, urban backpacking, games and initiatives, and trainer’s training, among others. “We have a 10-year-old program that deals with the hearts and minds of the youth in the Philippines. We have graduated close to 8,000 campers. What we promise is that those who will attend our program will never be the same again. You may come into the program with different backgrounds but when you graduate from our program, you will be enthusiastic, you will engage in various activities, and you will become leaders of tomorrow,” Aboitiz said. KAC is one of the programs under RAFI’s Leadership & Citizenship focus area, one of the five focus areas of RAFI where future leaders are nurtured to prepare them to effect change. Its other focus areas are Integrated Development, Micro-finance & Entrepreneurship, Culture & Heritage, and Education. KAC is an organization member of the Association for Challenge Course Technology-USA and Association for Experiential Education-USA. For more information about KAC, please call 418-7234 local 207 and look for Daphne Dia or visit www.rafi.org.ph.